Golf Course Foreclosure Properties in Las Vegas. As many of you know, Las Vegas is not only the #1 place to gamble, it’s also the #1 place for foreclosures in the nation. Not the best category to be #1, but it’s created some wonderful opportunities for buyers looking to get a great deal. I like looking for hot deals for my clients, and I’ve searched for golf course frontage properties that are bank owned. I found 7 foreclosures in all of Las Vegas that are right on a golf course. These properties are in luxury communities such as Anthem Country Club, Legacy Golf Community, Red Rock Country Club, and Master Golf Community. Take a look at these bank owned properties with Golf Course Frontage by click on the image below. If you’re like to do your own search for homes online with CURRENT property status and information, please click on the icon below. This is a free service I offer to all of my clients who want the freedom to search on their time. There’s no obligation and I’m available for information. 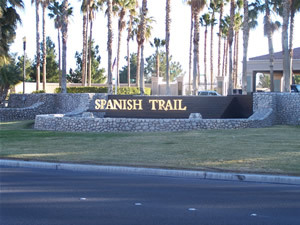 Spanish Trails is a beautiful guard gated community located approximately 15 minutes west of the strip. The community is located on the corner of Tropicana and Rainbow. It’s such a beautiful neighborhood with tons of gorgeous, mature trees and landscaping. There are 1252 homes here in 11 separate neighborhoods/communities. Amenities include fitness center, tennis center, 2 pools and 2 spas. The 4 town home neighborhoods have access to these as well as their own pools and spas. Memberships are available to the Spanish Trails Golf and Country Club. These are offered and sold by individual members. Prices for golf memberships usually run under $30,000 with social memberships available from the $3,000 to $4,000 range. The association provides lists of memberships available for sale. Most of these homes were constructed in the 1980’s and 1990’s. This project was the first of its kind in Las Vegas. As of April 22, 2008 there are currently 20 homes on the market with Golf Course Frontage. There are many different styles of homes here in Spanish Trail. Ranches, Custom Modern Homes, Townhouses, and Estates. If you’d like to see any of these properties currently on the market, please contact me at felipe@felipecrook.com or call Toll Free 1-866-589-1646. Many of my clients are using a new tool I just implemented into my business. It’s called the Home Buyer’s Scouting Report. 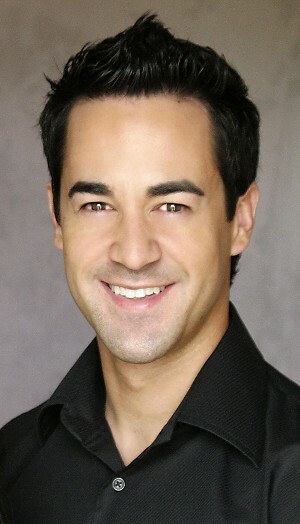 This is a website that provides my clients real time access to the MLS to do their own search. If you’d like to use this free service, click on the image below and follow the instructions. Let me know if you need any help. I have been working with a few clients interested in Golf Course Frontage homes here in Las Vegas, and I though it would be great to let everyone interested in these types of homes wha t is available around the city. This is the second post in a series of Golf Course Homes in Las Vegas. Canyon Gate is a gorgeous community on th west side of Las Vegas. For more information about Canyon Gate CLICK HERE to read my earlier post about the community. I’ve been seeing prices fluctuate depending upon if they have been updated or need to be remodeled. There aren’t many golf course homes available right now in Canyon Gate, but the 17 that are on the market are nice homes. Click the picture to the right to see the current golf course homes on the market. If you’d like to have FREE access to the Multiple Listings Service, click the picture below and fill out the registration form. There’s NO obligation. Happy house hunting! Red Rock Country Club, a luxury golf community on the west side of Las Vegas, has wonderful amenities to offer its residents like being in a guard gated community, member’s club, tennis courts, a fantastic view of the mountains and the city.If you’d like to learn more about membership opportunity, check out Red Rock Country Club’s Website. There are over 1130 homes in the entire community, not including the homes currently under construction. 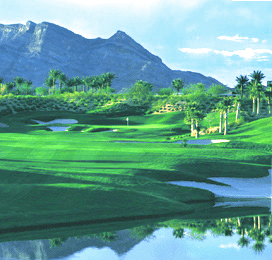 As of April 15th, there are 52 golf course properties on the market in Red Rock. 11 of those properties are under $1,000,000. To see the current inventory of Golf Course Frontage Homes CLICK HERE. There are lots of properties to choose from right now, and buyers are able to negotiate aggressively because of the high inventory. If you’d like to take a look at homes in the Red Rock Country Club area, please give me a call on my cell at 702-683-2169 or email me at Felipe@felipecrook.com. If you’d like to do your own search, please click on the picture below to have free access to the Las Vegas MLS system. Canyon Gate is a beautiful community located on the west side of Las Vegas near the intersection of Durango and Sahara. This neighborhood is a 24 hour Guard Gated golf community that boasts beautiful views of the mountains and of the strip depending on your location within the community. The architectural style ranges from Tuscan/Mediterranean to modern and contemporary. As of January, 22 2008 there are currently 6 properties for sale ranging from a recently foreclosed home listed at $689,900 (which is quite a steal in this neighborhood) up to $4,200,000. The neighborhood broke ground in the late 1980’s. The properties that have not been remodeled reflect that in the listing price. 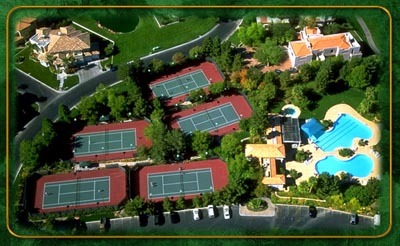 Canyon Gate Country Club is a very elegant, family friendly club. There are many levels of membership depending on your lifestyle and needs. The Golf Membership: offers unlimited use of the golf course, the tennis courts, swimming pools, fitness center and all clubhouse dinning facilities. The golf course is a full 18 hole championship caliber course designed Ted Robinson. Players will have to negotiate 70 sand traps and 12 lakes. 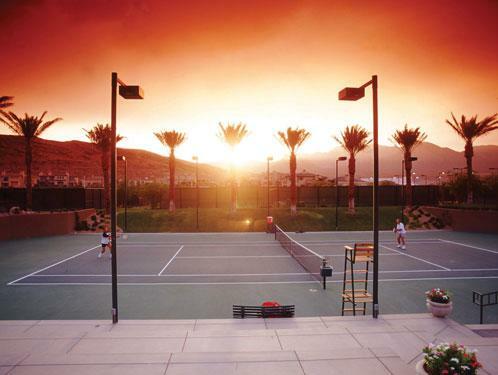 Tennis/Athletic Membership: includes full use of the tennis, swim, fitness, and clubhouse dinning facilities. Dinning Membership: offers unlimited use of the clubhouse Dinning Rooms and is the perfect way for the first time Private Club Member to experience gracious Country Club living . To continue the tradition of membership by invitation, The Board of Governors invites every member to exercise this privilege and responsibility. Canyon Gate has also established a reciprocal relationship with over 230 clubs world-wide which include prestigious City Clubs, Country Clubs and Athletic Clubs, with the exception of Resort Clubs, where there is a nominal fee. Thursdays: Family Value at the Grill. If you’re interested in looking at properties in this neighborhood, please contact Felipe Crook directly at 702-683-2169 or email me for available appointments at felipe@felipecrook.com.